Marco Reus has given bad news to all the top European clubs who were keen to land him in the summer as he pens new deal at Borussia Dortmund. The Mirror made a heading after his new deal that he will 'do a Steven Gerrard'. The Dortmund officially announced earlier today that he has signed a new long term deal which will keep him until 2019. Reus was heavily linked with several top European sides including Arsenal, Manchester United, Liverpool, Chelsea and La Liga giants Real Madrid but now will have to scout other talents as the player has decided to stay for a long time in Germany. It was predicted that Reus is likely to leave in the summer as Dortmund is struggling in Bundesliga but the player is determined to help his side to get back on their form. 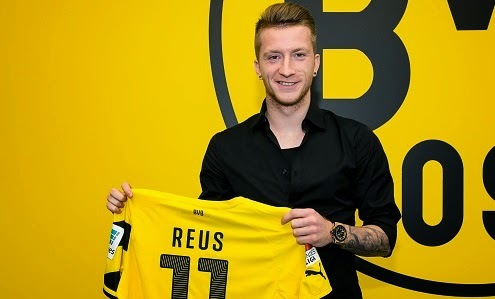 Reus who was linked with a £20million move has no release clause in his new contract. The 25-year-old attacker who missed the World Cup revealed his happiness after signing a new deal. Dortmund have recently climbed the table after winning Freiburg last weekend and are eyeing to further climb and finish the season as high as possible.